Isiah is a total foodie. At our first session, while talking about his family, he mentioned the fact that he cooked breakfast for his younger siblings – scrambled eggs, pancakes and hotdogs. I don’t know what impressed me more – that he was responsible enough to be in charge of his siblings’ morning meal or that he knew, at thirteen, how to cook scrambled eggs, pancakes and hotdogs. I think this was my favorite mentorship session with Isiah for two reasons. 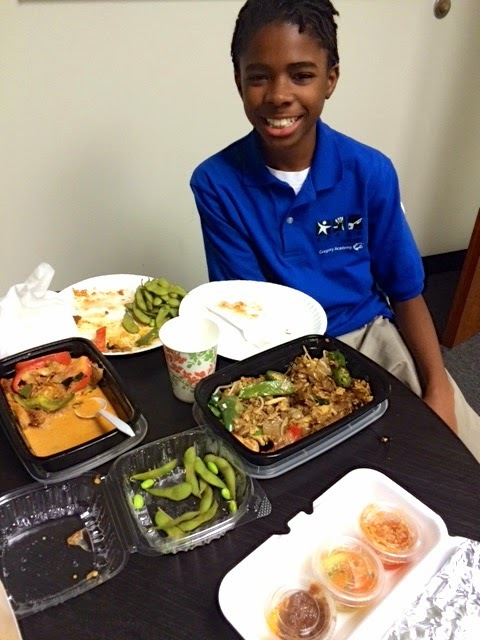 First, Isiah was genuinely blown away by the experience of the Thai food. He must have said “This is so good!” 50 times, practically after each bite, most of which were completely new foods or flavors to him. Second, I was genuinely blown away by Isiah’s articulation of the experience. At one point he lifted a small plastic cup of dipping sauce for the fried tofu to his nose and gave it a couple sniffs. “This has got peanuts in it, and some chiles, and something sweet.” As he took in the duck curry: “The duck is so juicy and mixes well with the sweet pineapple and spiciness of the sauce.” This went on dish after dish. The kid has a refined palette. More impressively, he has a knack for talking about what he’s tasting and experiencing that most food personalities on television would envy. Being the cook in my family and a lover of lots of different kinds of food, I felt especially fond of this experience. I told Isiah he should think about doing a culinary mentorship next semester. He has a great affinity, a natural born talent perhaps, for food. While the Thai dinner became the centerpiece of this particular session, we did accomplish some real work. We need to move our project along, after all. Isiah and I actually spent the first part of our session video chatting with Rachelle Damminger, Spark’s Director of Communications. Rachelle is based in our Philadelphia office and, among many other responsibilities, handles all of Spark’s website updates. Since Isiah is building a special page on the Spark website dedicated to students, and because he’s big into networking and collaboration, I wanted him to connect with Rachelle to learn the mechanics behind getting the content he’s developing onto the actual website. You can always tell when people are really engaged – whether an adult or a young person. There is that telltale sign of leaning in, eyes intently focused on the subject. Isiah’s attention was fixed on the screen as Rachelle gave him first an overview of her job and the important role she plays at Spark and then a peak at the “back end” of the Spark website. It was the first time Isiah was exposed to the inner workings of a website, namely the content management system that makes a site work. Rachelle was able to share her screen and walk him through an example of an update, which turned out to be an awkwardly large headshot of me placed smack dab in the middle of a page about Spark alumni. She promptly took it down, after we had a chuckle. 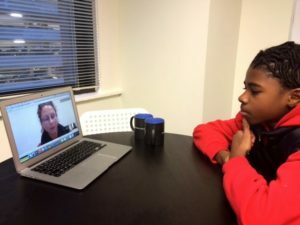 In addition to engaging with Rachelle, which Isiah liked a lot, and learning about the technology behind website maintenance, he got a taste for how professionals at an organization like Spark interact. Like many companies and nonprofits, Spark operates in multiple locations, with teams of people in each that must interact with one another from a distance virtually. It can be quite challenging at times. But, it’s an important practice to master in the professional world. I’m glad Isiah got a little taste of it. Later on, Sahrish Saleem from the Spark team in Chicago popped in to spend some time with us as we worked on finishing up some of the content for the web page. Sahrish is new to Spark this year and serves as a Volunteer Coordinator, responsible for supporting mentors from five of our ten partner schools in Chicago this year and making sure the students are getting out of the program what we intend. Sahrish and her peers at Spark across our sites are in many respects the lifeblood of our program. They are the ones who make the magic happen among the students, schools, mentors and company partners. And, as in this instance, they are an important check on program quality. I felt a little bad that Sahrish came in when she did. Not because she was disruptive in any way, just that she missed the best parts of the session! Namely the video chat with Rachelle and the Thai food. Nevertheless, as a mentor, I valued her presence and had a good check-in with her the next day to get some feedback. I have been reassured by the personal support I have been getting from our team. As I mentioned earlier, there is a weight of responsibility working with a young person, wanting to do right by them and make an impact. The attentive and personalized supports make the whole experience more manageable. I don’t know how we’re going to top this one. But, we’re past the halfway mark now and zeroing in on our culminating project and Discovery Night. I wouldn’t be surprised if food sneaks its way into the final presentation somehow.